Internet Access Controller you can restrict, block web sites and limit internet access at specified time, schedule or on demand. Password protect an internet connection or website. Great for parental control or to prevent employess from inappropriate internet usage. 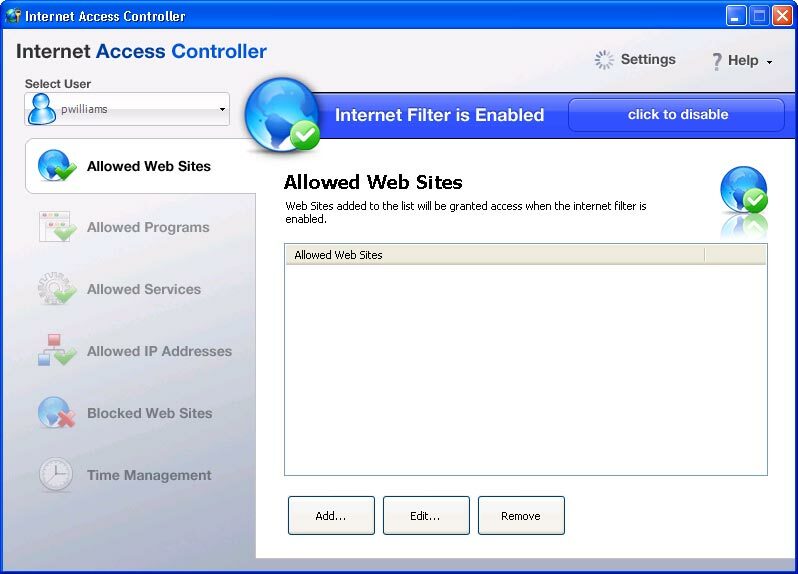 You can block, limit, allow which programs have access to the web. Disable internet connection after specified amount of time. control your computer's internet and network connection. Restrict, block, limit internet access or web sites specified schedule, time. ...... You can block, limit or allow which programs and services have access to the internet. The timer feature allows you to disable the internet connection after a specified amount of time. IAC gives you complete control over your computer's network connection. Qweas is providing links to Internet Access Controller 3.1.0.450 as a courtesy, and makes no representations regarding Internet Access Controller or any other applications or any information related thereto. Any questions, complaints or claims regarding this application Internet Access Controller 3.1.0.450 must be directed to the appropriate software vendor. You may click the publisher link of Internet Access Controller on the top of this page to get more details about the vendor.